To argument the health benefits that our Feeding Program provides to the school children and address the medical needs of the whole community, we launched a regular bi-monthly medical check-up and medical mission in 2014. This is conducted together with a hygiene campaign to address health and medical issues lingering in the community. 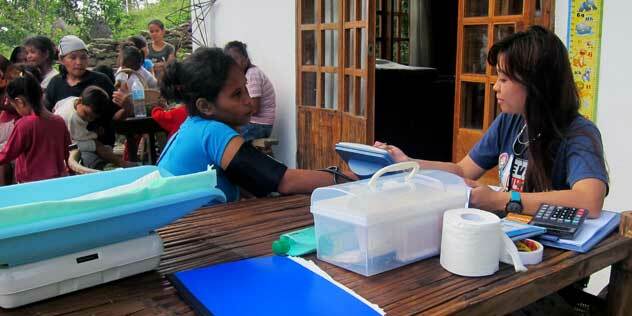 A local doctor volunteers his services to facilitate the regular medical checkups. For the time being, a room at Stairway’s Farm House at the Baclayan Organic Farm serves as a provisional clinic. The clinic stores an ample supply of common medicines and multivitamins, and it is equipped with some basic facilities like a nebulizer, weighing scales, and equipment to check the vital signs like blood pressure, heartbeat and breathing. The doctor is assisted by one of our community workers, who is a nurse by profession, along with a local health worker from the village. The clinic opens its doors in the morning for adult and non-school patients, while children in school get the afternoon session. Some of the common sicknesses diagnosed are cough, colds, headache, muscle pain, gastric pain, body malaise, dizziness and skin rashes. Pregnant mothers also frequent the clinic to avail of supplements and vitamins, delivered with sound advice on how to go through the pregnancy. It is common practice that mothers in the village do not go to regular checkups during pregnancy and just give birth at their homes. Cases of asthma are treated with nebulizer and oxygen, while those with potential tuberculosis are sent to the government health center down in town for proper checkup, and to get under a subsidized treatment and medication program. Regular once-a-month dental care education and delousing activities are carried out in school every second and fourth Monday of the month, when there is no doctor in the clinic. By first quarter 2016, we plan to build a clinic/health center next to the village school. The new structure will serve as much as a center for education and information on health and hygiene, as it will be a clinic for treatment of ailments and disease.